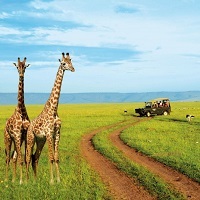 Kenya summons you to its exemplary sights, ancient tribal cultures and natural wonders. The alpine, snow-capped peak of Mt Kenya, the Masai Mara's golden, lush plains, the pink blush of Lake Nakuru and the annual migration of millions of wildebeest are just some of the delights that Kenya offers. This rich, energetic city has something for everyone. Operational from Nairobi, Kenya, African Hartebeest Safaris makes sure that we translate every single bit of this culture-loaded land because you have not seen a country unless you know the history and significance of it. We offer excellent packages for Honeymoons, Romantic holidays, Family holidays, Beach Holidays, Group holidays, Adventure Tours, Pilgrimage /religious Tours, Heritage & Culture Tours, Wildlife Tours, and Yoga & Ayurveda Tours for all over Kenya at nominal costs. We also boast of proficiency in offering customized service according to the client needs and budget.